Want to make your family reunion the best ever? Don’t miss Experience Columbus’ free Reunion Planning Seminar at LA Catering on Oct. 3. You’ll get tips from genealogist/family historian Gayle Dowdell Wilson on how to make your reunion run smoothly and how to create memories your family will treasure for years to come. Get answers to questions about working with hotels and other tips to ease your workload. Register and get complete details here. Of course, entertaining your family while they’re in Columbus for the reunion is easy. Fun family-friendly activities can be found here every season of the year. Enjoy a once-in-a-lifetime opportunity to interact with exotic animals at the Columbus Zoo and Aquarium. TTouch stingrays, walk among kangaroos and watch as the three polar bears swim overhead – just to name a few of the close animal encounters awaiting. Cool off in style on the dozens of water rides at Zoombezi Bay, located next to the zoo. 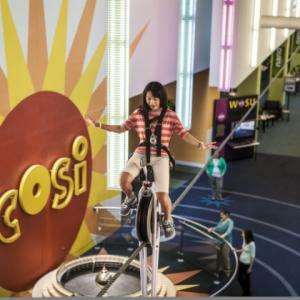 Ride a high wire unicycle, use sonar technology and get hands-on with countless activities that make science entertainment at COSI. Walk amid hundreds of colorful butterflies during Blooms & Butterflies all summer long at Franklin Park Conservatory and Botanical Gardens. 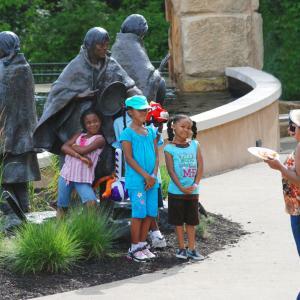 For more family fun, head to the hands-on Center for Creativity at the Columbus Museum of Art. The King Arts Complex also makes art interactive and educational, with talking African masks that tell the history of African Americans. See what life was like on the Underground Railroad at the Kelton House, where you’ll hear a first-hand account of life on the run. Trace your genealogy at the Ohio History Center. Along with an impressive historical collection, the center offers extensive resources for you to study your family’s history. Plan your reunion around our full calendar of family friendly festivals, happening nearly every weekend spring through fall. Hear the best in jazz at the popular Jazz & Rib Fest every July and at Gahanna’s Creekside Blues & Jazz Festival every June. View our continuously updated calendar of events. Hold your reunion at one of our many parks that offer much more than just shelter houses and grills. Watch a herd of bison and explore the new interactive nature center at Battelle Darby Creek Metro Park on the southwest side. 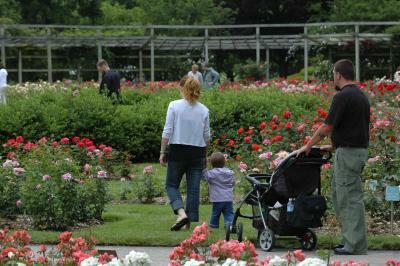 Whetstone Park, north of downtown, is home to the Park of Roses – one of the largest municipal rose gardens in the nation. 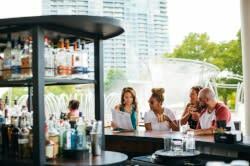 Get a great view of the downtown skyline at the Scioto Mile and cool off in the interactive fountains. Check out our Reunion Planning Checklist. And when the time comes, Experience Columbus staff can assist with hotel arrangements; provide you with visitor guides, bags and pens.